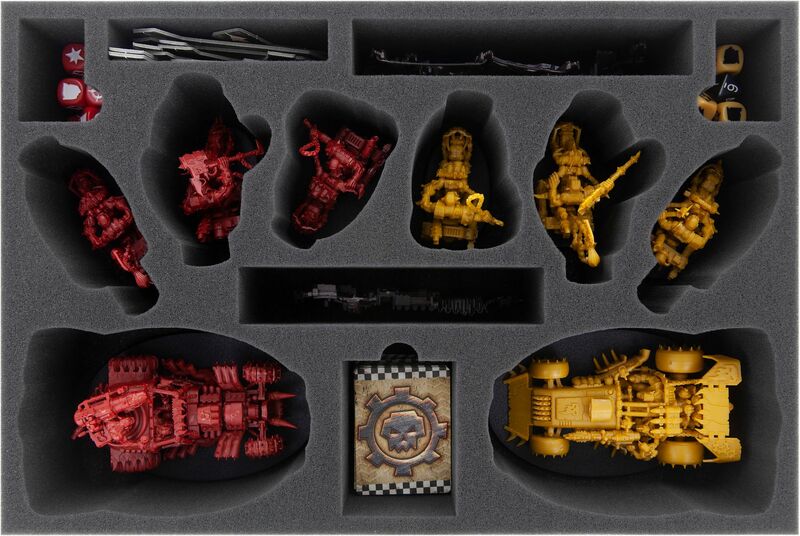 Boosta-blasta, Dragsta, all Warbikerz, barricade scrap and all da gubbinz - all ‘n da real box! Rac'n, fight'n and radly shoot'n! 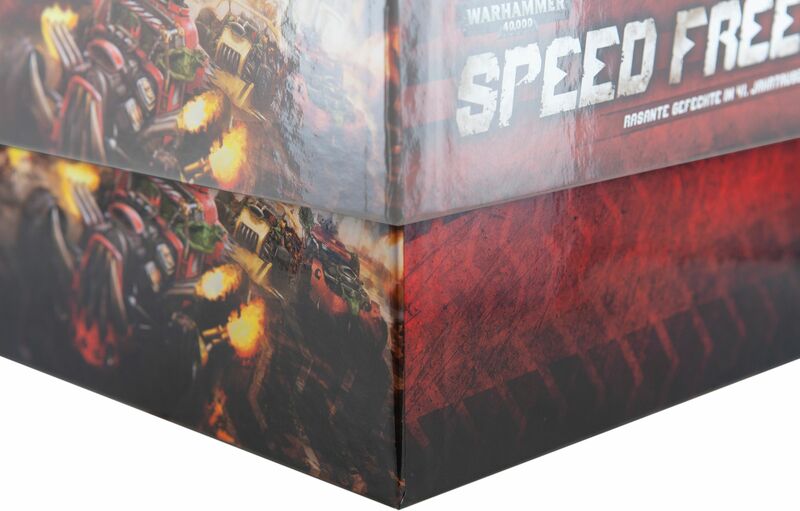 Grab your speedmob and compete in high-speed battles in true orkz style. Although such a wagon races through the wasteland of Vigilus according to the divise "Maximum speed with minimum protection", your miniatures should be happy about the protection after the race. To make sure your Grot doesn't fall off your rear, we have this kunnin' foam set for your board game box. 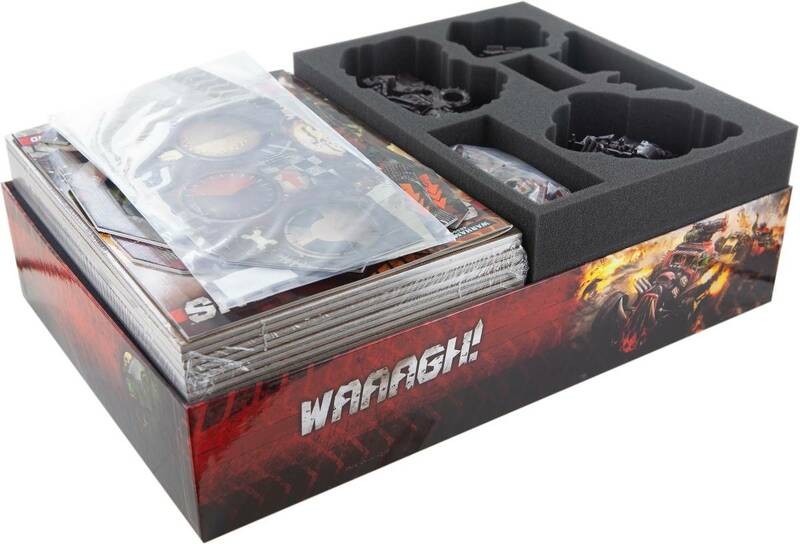 The set fits exactly into the 'Speed Freeks' game box from Games Workshop. 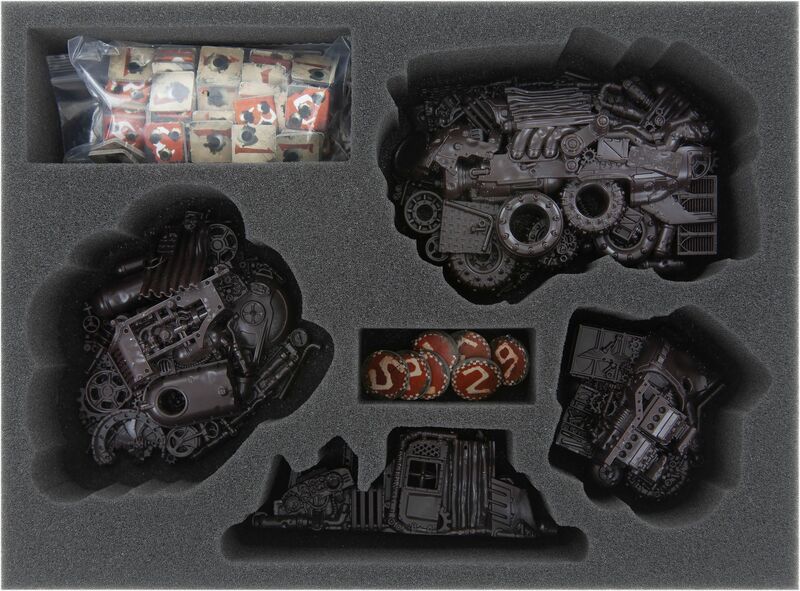 Provides space for all 8 vehicle miniatures, the barricades and the entire game material from the core game. The lid of the board game box protrudes approx. 5-6 cm. Two foam inserts do their best to keep the orks and all da gubbinz in check. The lower foam tray has individually tailored compartments for each vehicle. The Kustom Boosta-blasta, the Shokkjump Dragsta and the six warbikers are completely surrounded by foam. Each of the numerous fine details is thus optimally protected against damage during transport. The spikes remain pointed, the rivet kannon on the roof and the tailpipe on the bike. You don't even have to worry about painted vehicles anymore. The insert prevents the wagons and bikes from hitting each other off-piste and destroying days of painstaking painting. The colors remain unharmed and free from scratches. 2 additional compartments accommodate the barricades, a third compartment houses small movement templates and fire arc markers. Also this insert has 2 compartments for the dice and one for the cards. The second tray takes care of the remaining barricades with tailor-made compartments. Additionally there are two compartments for sorting the tokens. A suitable foam topper is placed on each inlay so that the miniatures are completely wrapped in foam. Besides the mat for the barricades there is still enough space to store the gameboards. You can also put the remaining arc markers, the bigger movement templates, the screens and dashboards, datacards and the ruler on top of it. 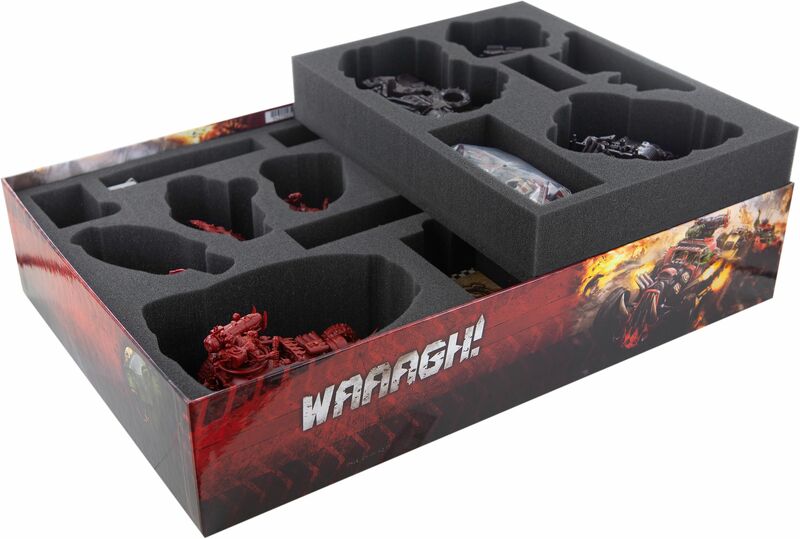 Hereby, all 8 vehicle and barricade miniatures are safely stowed away, all game material is neatly stored and the contents of your box are enormouzly protected and ready for da next Speedwaaagh!